The Golf Club is situated on the outskirts of the town of Carrick-on-Shannon – the cruising capital of Ireland. The golf course, a parkland course constructed to the highest USGA specifications, is located by the banks of the Shannon, patrolled by the Argina Mountains and is simply spectacular. It is an ideal location for your golf outing, be it a sociable fourball, society or corporate outing. 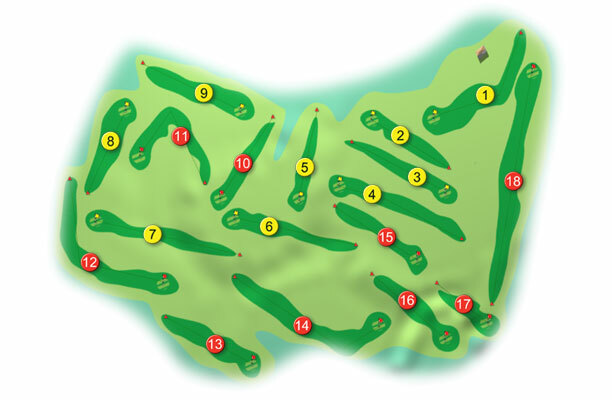 It is an excellent 18-hole course with delightful diversity of scenery. The new nine holes were built on land that sweeps down to Drumharlow Lake and the Boyle River creating some spectacular views of the lake and river. The location of the new nine holes is magnificent. Some 12 acres of marshland were preserved and integrated into the design, creating some wonderful holes and generating some anxiety when one has to play over it. The old nine holes are set in mature parkland and under the revised layout will constitute the first five holes and last four holes of the 18 holes. There are some spectacular holes, not least the eight where the tee-box is surrounded by water, which require a carry-over of the Boyle River. The 13th hole is a frightening par 3 – just 200 metres “short” and has all the hallmarks of becoming rather special in Irish golfing folklore. Word of mouth and pictures only tell so much of the story.